Cherry sleeping on Shelley's lap. Photo courtesy of Shelley Young. After the longest kidding season in Double Y Farms history, it has finally come to an end! The long awaited arrival of Snicker's babies happened last Friday with two beautiful doe kids. The picture is of Cherry, who was actually sleeping in my lap. She has a sister, Tootsie, that looks nothing like her! I may add that these are not normal names for our goats. But that's another story. So we ended the kidding season with 52 kids on the ground out of 22 does. We, sadly, lost four but that is part of raising livestock. 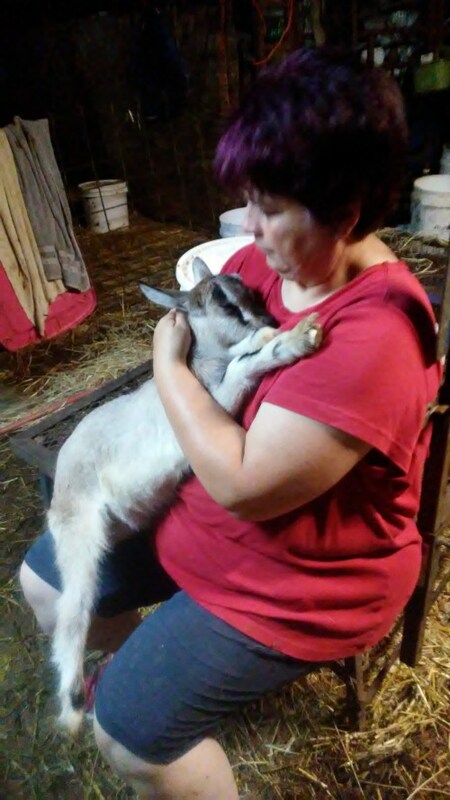 And, I might add, that after professing that we would not keep any kids from this year except Snicker's babies (this was decided before we started breeding and yes, Snickers is that "special doe". Just ask her, she will tell you!) we have managed to hold back and register a total of 11 of this year's kids. What can I say? It's an addiction! So with the close of kidding season we have been immediately thrust into show season. Ayana is in Columbus, Ohio as I write this attending the American Dairy Goat National show. There are 3,400 animals entered this year. I cannot imagine the noise in those barns with all those goats! We sent six animals this year. Tonight, Double Y Farms Oldleghumper will be the first of ours to enter the ring as an alpine junior kid. I told you Cherry and Tootsie were not normal names for us! Ayana will also have animals in the recorded grades and sables. Before nationals, Ayana and her friend, Savannah, went to Terre Haute to help the farm they work for clip their animals for the show. Ayana clipped two of ours before she left. I thought, "No big deal, I can handle four goats!" I often think wrong. I washed four animals that morning and waited for them to dry. I worked feverishly on Humper (Oldleghumper) as I felt that she is one of our best kids this year and I wanted her to look really good for nationals. She stood perfectly still even while I did her legs. I got to her ears and, with a touch of disappointment, I whispered in her ear "Hump, I'm really not liking this topline you have" And as I did this I looked into her ear at her tattoo and realized....I clipped the wrong goat! I ended up only clipping three animals, Humper, Ali and Puta -- Puta being the Humper imposter. But she was grateful to have all that hair gone with the heat and humidity. I need to add, when clipping goats in the heat and humidity that we have had, you end up with goat hair in places that you forgot you had (at least at my age you have forgotten) or in places that you never even knew you had! Oh how I hate clipping goats! A garden hose bath is required before entering the human shower inside the house. Along with show season comes judging and I had the pleasure of judging Vermillion county last week. I love to judge as I get to work with the animals and the youth. Indiana cannot be beat when it comes to quality of showmen, and their ability to be humble, helpful, and gracious no matter where they stand in the lineup. It does my heart good to see showmen not in the front of the line give the winner a high five and a hug. This happens more often than not in Indiana! While show season is underway along with judging and the end to kidding, not much changes on the farm. Like this morning. Since neither Sydnie nor I had to be at work early I decided that we could sleep in just a bit. Up and out the door at 8 a.m.with only seven does to milk is pretty easy with two people -- until you see four of the five bucks running wild through the yard as if a rabid coyote was after them. The other one was still in the pen with his head stuck in the fence. The thing about goat bucks is they are all pretty much idiots. There was no coyote. In fact there was nothing. They were our of their pen so they simply had to run -- from us. For 30 minutes! Last one went under the hot wire into the neighbor's pasture. I'm telling you at my age and voluptuousness, running after a buck in this humidity does not end well. I just don't sweat pretty! Fortunately, the buck was caught and returned to his pen and emergency responders were spared from having to haul a sweaty, fat woman who smelled like a buck, to the hospital. To the Hope first responders -- you're welcome! I had to take a walk into the wood Sunday to find Cassie cow. She has not been wanting to come up to the barn lately to eat so I grabbed a bucket of feed and headed off. She was relaxing under a tree chewing her cud and was ever so grateful that I brought her supper to her. She is going on 18 years now and, like many of us, age is taking a toll. As I often tell people, this getting old stuff is not working out well for me. Same for Cassie. She has a spot just across the creek that is one of my favorites. There is a lot of tree cover and it is very peaceful there. It is her safe place. Her "recliner" so to speak. I decided to take the long way back to the barn and, even though our farm is small, its beauty is breathtaking to me. My animals followed me on my little walk. Under the down tree, through the creek and up the hill back to my little shack of a barn. In the eyes of most it is nothing spectacular, but to me it is my world. It is peaceful and has all the things I love. Life on my little farm.